The Graham Bonnet book is now in stock. We will begin mailing out next week once we have got all the stock shelved, counted and checked. It does look excellent though, and any fans of the singer should be pleased that he has been served so well by author Steve Wright and also by our design team. Everyone who has placed a pre-order will be emailed with an update next week and you can still do this for the next few days and get the discounted rate (or the special signed edition which is mail-order only.). The delivery itself was huge fun; our office is down a narrow lane and we warn all delivery companies about this. So when the stock turned up on a full size continental articulated truck at rush hour last night it posed a few problems; there was the stock, all nicely palletised… but with no tail lift, or pallet trolley! The driver pretended not to speak English, opened the back doors for us, shrugged, got back in his cab and went to sleep. It took the pair of us about an hour to pull the pallet apart, unload the books onto one of our own pallets at the side of a busy road, then into the boot of our car, a drive round to the storage area under the office and unload; repeat six times! The joys of running your own business. We sneaked off to a local country inn for dinner, and figured we’d earned it! 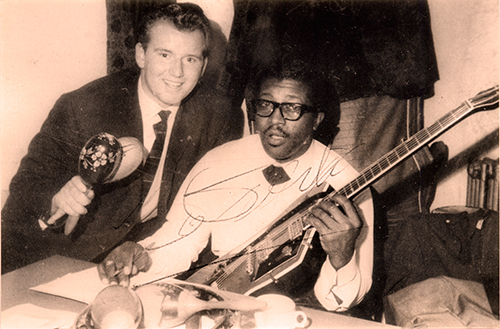 Not that the compiler of our upcoming book of vintage blues photographs Boom Boom Boom Boom needs to prove his bona fides, but we couldn’t resist showing these two great images which photographer Brian Smith sent us to go with his author profile on the Easy On The Eye Books site. 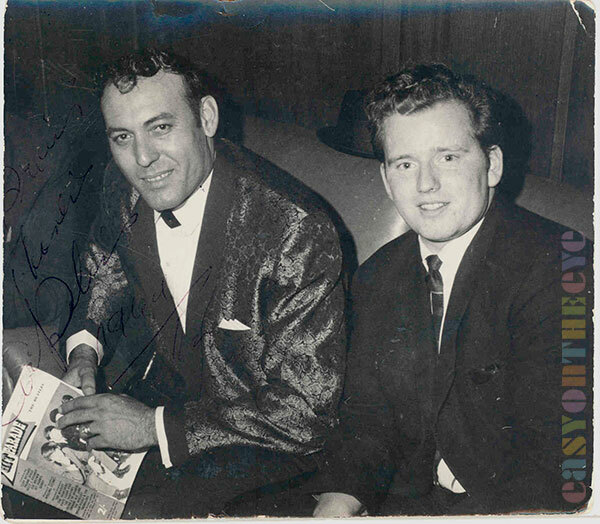 The first image was taken backstage in the dressing room at Sheffield City Hall in 1964, and shows Brian with one of his musical heroes Carl Perkins. Brian went on to run Carl’s UK fan club for several years. Brian was also the official photographer for Manchester based R & B Scene throughout the life of the magazine. 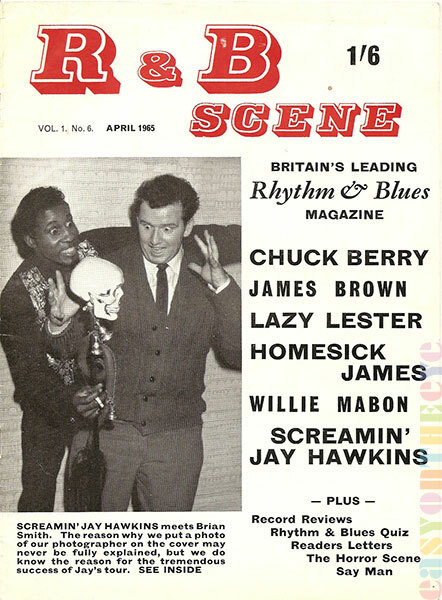 But while he mostly took pictures, on this occasion the tables were turned for a publicity shot with Screaming Jay Hawkins – which the editor thought would make a great cover image! This issue came out in 1965. Our latest title, Deep Purple – Wait For The Ricochet, is out this week. 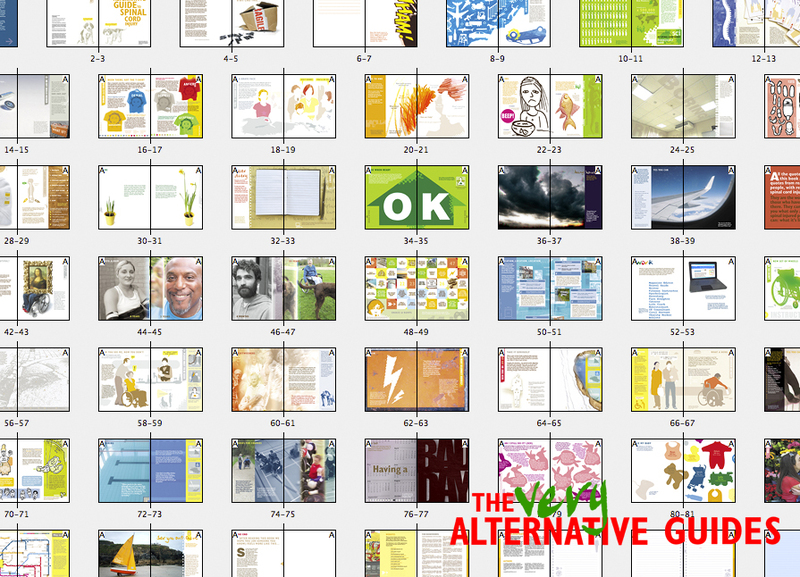 Copies are shipping from Jan 27th onwards to people who pre-ordered. It can still be ordered via the Easy On The Eye online shop, and will be available to order through bookshops (quoting the ISBN) in a couple of weeks. There are only so many hours in a day and easy on the eye have been deeply involved in a number of music related coffee table books over the past twelve months. These are being released by RS Publishing. There have been titles on Deep Purple (documenting a famous festival appearance in America back in 1974), with books on Yes due in a few weeks and others to follow. The books are of an amazing quality, printed and hand-bound in the UK, in large format, and produced to very limited numbers. As you might expect they make huge demands on the producers, and the Deep Purple one alone took months of design work (not to mention talking to photographers, scanning and retouching work). Needless to say this has slowed production of our own projects some, although work has been going on and all being well we will be announcing our next available titles in the next two months. We will be working with RS on future projects. In the meantime, here are a few spreads from the Deep Purple book and you can find out more at the publishers own web site.These titles are not available in shops but only through them.